Confused Soul: Is there any future for these children? Hurray, it was just 1600 hrs and Tinu was in a jolly mood to leave us early and everybody is running out from the class as we, a group of 4, rushed towards Jai Singh's shop to grab some Tea and Somasas. As we called Chhotu to bring some samosa's and tea but today he was looking a bit different... he was looking as if he was tired a lot he was ill and still he has to work. He has to work to earn food for himself, to get food for his sister, to earn money for daily liquor of his father. We asked him what happened and he said nothing but asked for our order. It always hurts me to see these small kids working anywhere. Whether it’s home or restaurant, factory or any other place, it always hurts. If I can’t do anything, I always encourage people about the study and schooling of these small hard working humans. 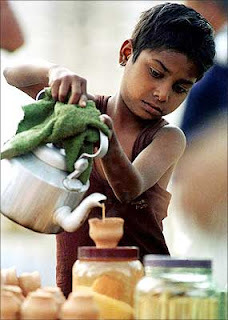 At all these small tea-stalls and at other places, when I see these small kids working, I do always used to go to them and share some time with them. But life runs fast and now days I am not able to do all this. May be because, I don’t go to have tea outside or I don’t find anyone out here. It has been one-and-a-half years since the government banned the hiring of children as domestic helps or for employing in restaurants and eateries. The worst thing is to see the Police constables talking in the rudest manner to these kids in place of suing the owner. The ban was merely an extension of the Child Labour Act, 1986, under which children are prohibited from working in hazardous industrial units. India, home to the world's largest number of child labourers (the official estimate is 11 million though the actual figure is estimated at over 100 million), is indeed keeping its dubious record intact. But the question is not to save these children from the lobor imposed on them but to decide what to do with them. Some actions have been taken by the law-enforcing agencies but they have mostly remained just a farce. About 550 boys aged between 5 and 15 were rescued from these shops, but no one could decide what to do with the children. Also the interesting thing is to know about the wages they get. Take the beedi industry for example. The average number of beedies a child laborer rolls in a day is 1,500, for an average daily wage of Rs 9. In this Rs 9, he has to do all the things I have mentioned earlier and think if any day he get victimized of working in these hazardous situation in only this age of 7 or 8 or 9. This reminds me a cartoon of R.K.Laxman from the recent book, I read. 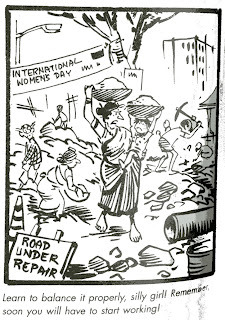 Though it was for women’s empowerment but very relevant in the context. If we can’t do anything like adopting someone or get someone educated or joining an NGO, which work for same reason. At least we can spread awareness about this; we can spend some time with them. Whenever we stop at an roadside Dhaba and see small hands in work, we can have a talk with the owner. Also if we can’t help them financially, we can help them emotionally. Also, if you are donating money or something, please make sure that your help is getting to the place where it is actually needed. Choose right NGO’s and orphanage to make donations. Help the needy, not the greedy. Last but not the least, these children need your emotional support more than financial one. So, if possible please plan to spend some time with them and that will really make a difference to them. Dhaabe ka chhotu hu mein, nij bimb se hi jhagadta hu. kutta nahi to devta, yamraaj ka yaa doot hu? aiy darpan tu hi bataa, ab tu hi keh mein kaun hu!?"